TsukuBlog | Mt. Tsukuba`s Wild-Boar Population Increasing – and so do their forays down to the farms and garden on the plain below! Japanese wild boar (Sus scrofa leucomystax) are veritable vacuum-cleaners sucking up mushrooms, tubers, worms, grubs – and much more, off the forest floor. I have often seen groups of them on the roads up to the Mt. Tsukuba Shrine IN THE EVENINGS, but now, with increasing popultions – and much less hunting, they are making more frequent forays down the plains below! Delicious buckwheat (SOBA) is grown in the Tsukuba area, and one thing that I really look forward to each year is the soba-noodle making party I have with my friends every November. One of them grows the buckwheat at the foot of Mt. Tsukuba and brings us the flour – from which, after a couple of hours of hard work, are turned into the absolute best soba noodles I`ve ever had – we even make the dipping sauce ourselves. As October turned to November, and I passed fields of ripening buckwheat at various locations around Ibaraki Prefecture, my mouth started to drool with anticipation, thinking about our SOBA UCHI (buckwheat-noodle making) party. Then came the bad (even tragic ) news….. there would be no soba-making this year… my friend lost his entire crop…. not to bad weather…. 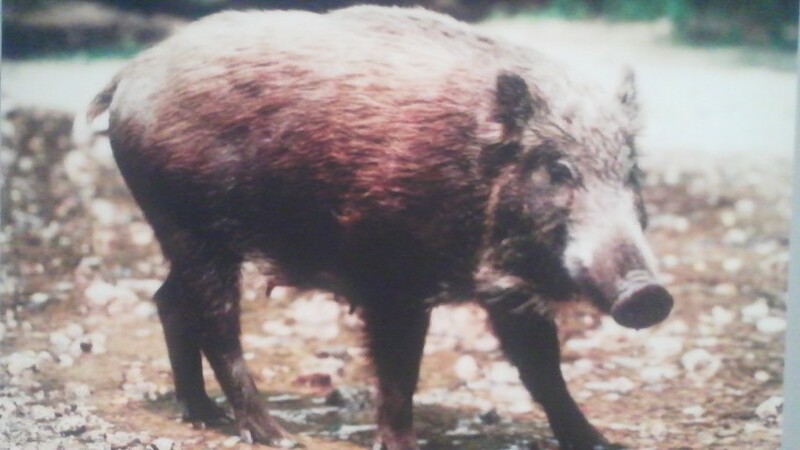 but to WILD BOARS! 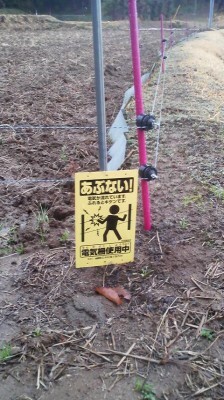 Although his field is surrounded by a low electrified wire, his field had been sucked clean. You couldn`t have done a better job with a lawn-mower. It`s time to raise the wire! 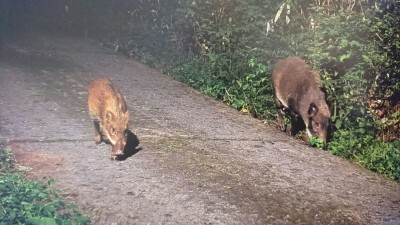 Wild-boars in Tsukuba? Yes ! There are hundreds. They live in the forests of Mt. Tsukuba and the other, lower mountains, connected to it. Despite the all the recent development, there still is plenty of wild-life in Tsukuba, alot of it which can be found not very far from the Tsukuba Center TX Terminal. Many of my strongest memories of my life here are of encounters with the local fauna : a goshawk briefly perching on my veranda, a huge ural owl swoops past me as I walk my dog, a two-meter long rice-snake in my front-yard, a Japanese hare hopping across the street illuminated by my headlights, a fox running out of the thicket, chased by my trusty dog, the weasels doing a sort of mating dance in the fields behind my house ….. the list goes on and on.. But perhaps the most thrilling of my Tsukuba wildlife encounters have taken place on the slopes of Mt. 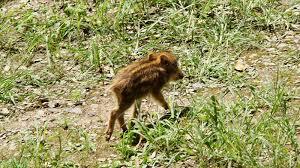 Tsukuba, and involve one of Japanese most ferocious beasts – INOSHISHI (wild boar). 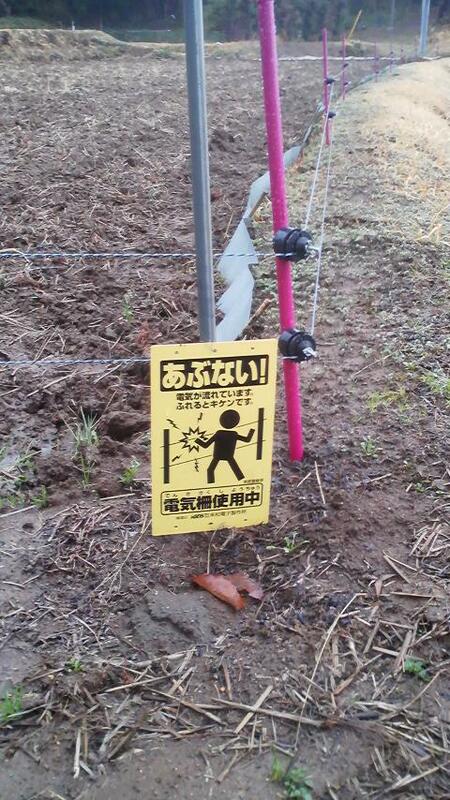 The boars have been getting over these electrified fences! These days, though, you don`t necessarily have to be on the mountain to run into a wild boar. Already this year there have been several reports of them prowling around residential areas in Tsuchiura, Ishioka and Tsukuba. 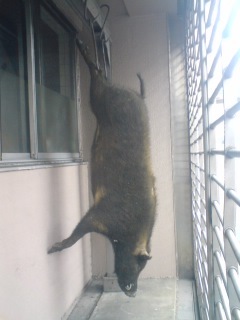 A few weeks ago, they found a big boar stuck in an irrigation ditch in Tsukuba`s Sasagi neighborhood – not far from the Space Center or the AIST Research Institute. Momonjiya is a restaurant in Ryogoku, Tokyo, (just around the corner from the National Sumo Sadium) has been serving game for about 200 years. They specialize in wild boar and venison. During the Edo Period (1600-1868) when the JApanese were forbidden to eat the meat of four-legged animals, the people called wild boar YAMA KUJIRA (mountain whales) – The logic behind this is that since whales were considered fish – they were edible. And by extension, if a wild is a whale, it is also a fish – and should be considered edible! The entrance to Momonjiya, one of Tokyo`s oldest restaurants. Wild boar is a specialty of the house. Why, you may ask, are the boars increasing? Well, many wild animals in Japan are – especially deer and boar. his is attributed to a decrease in hunting, which in turn is said to be do to the aging population of hunters. Millions of dollars in crops are being damaged each year. One solution has been to promotee EATING wild animals. You might notice that many restaurants are now serving venison. The other day on a Tokyo subway I so a poster advertizing venison burgers and “full-course” venison dinners. 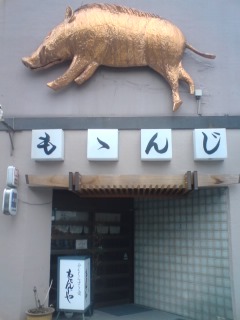 Eating wild-boar is an ancient custom in the Japanese archipelago. 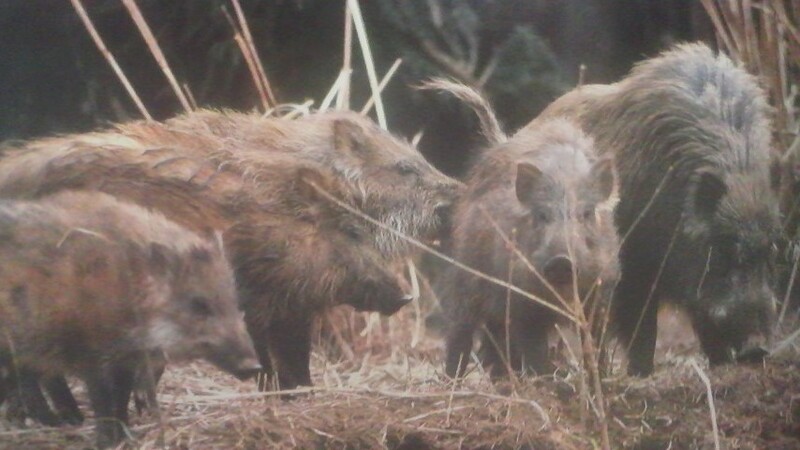 Prehistoric shell-mound (kaizuka) sites in Tsukuba show an abundance of of boar bones – a testament to many a good meal. 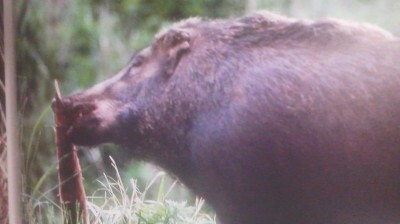 Wild boar munching on one of its favorite snacks – bamboo shoots! One of Japan`s oldest bronze artifacts, a bell-shaped DOTAKU, is engraved with an image of a boar shot by an arrow. During the Edo Period, though, the Tokugawa Shogunate forbade the eating of 4-legged animals. People DID sometimes eat meat for medicinal purposes. When they did this they would use a different fire from the one usually used for cooking, and they would also refer to what they were eating as YAMA KUJIRA (mountain-whale). Since whales were considered fish, and permissable as food, considering the boar a whale, justified their eating it. Even after the fall of the Shogunate and the “liberalization of eating” dishes that contained boar were given special euphemisms – which are still used today: BOTAN NABE (peony stew) or SHISHI NABE (meat-stew). But I have to mention a reason (not mentioned in any of the local papers) for why there has been an especially sharp decrease in wild boar hunting on Mt. Tsukuba. It used to be that a decent price could be had for Tsukuba`s boar meat which was consumed in specialty restaurant around Japan – and many locals enjoyed the meat themselves, or shared it with friends. The problem is, though, that boars eat off the forest floor – and Mt. Tsukuba is not that very far from the damamged nuclear power plant in Fukushima Prefecture. So the fact is that people are afraid to eat borar meat from Tsukuba – and no respectable restaurant would buy boar meat from this area. Anyway, before the government orders a major cull, take a drive up the mountain at night – you might have an amazing, and memorable wildlife encounter ! Some thing so unforgettable that you might forget about your cancelled soba party! Driving up or down slopes of Mt. 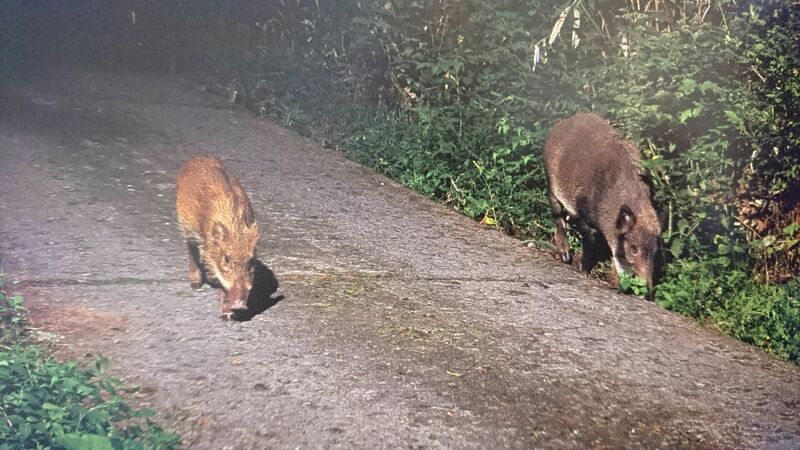 Tsukuba between dusk and dawn you are likely to see some wild boar hogging the road. Celebrating Soba again this year! Making Noodles, Dumplings and Cakes- all out of Ibaraki`s famed buckwheat! This year has been spectacularly bad, the worst I’ve seen. Our rice fields at the foot of Hokyo-san had a lot of damage (two friends’ fields were completely destroyed), and all the paths in the area are regularly dug up.